Is your birthday in March? If it is, then daffodils and jonquils are your birth month flowers. I had to do a little research on this one to figure out the difference. According to the American Daffodil Society, a jonquil is one of the thirteen divisions of daffodils. Bloom color, size and shape, as well as foliage type, flowering schedule and number of blossoms to a stem, determine the classifications of over 25,000 registered hybrids. All of these perennials fall under the genus Narcissus. DAFFODIL - are the large-flowered varieties. NARCISSUS - are the small-flowered and early-blooming types bearing clusters of blossoms. JONQUIL - often have fragrant yellow flowers. Blooms are comprised of two parts: the perianth, made up of six outer petal segments, and the corona in the center, shaped like a trumpet or cup (depending on length). Besides the familiar yellow and white flowers, daffodils also come in orange, red, apricot, pink and cream. In some varieties, the perianth and corona are different colors or varying shades of the same color. Leaves may be flat and straight or narrow and spiky. Following are a few hankies with daffodils for your viewing enjoyment. 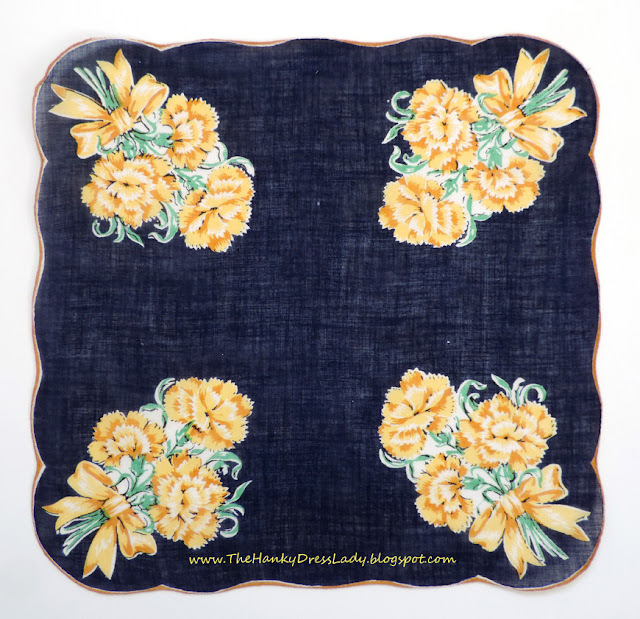 I decided this was a daffodil on this pretty yellow linen hanky. What do you think? I was surprised to find several blue daffodils. This is the sweetest little hanky. It measures only about nine inches square. I found this pretty hanky in two color versions; the other has a blue background with pink, blue and yellow daffodils. I think these daffodils are uniquely bold. This may be my favorite. White/Yellow Daffodils on a pale blue linen background. A Little St. Patrick's Day Welcome! I love to make Hanky Hearts almost as much as Hanky Dresses. These two were actually made for a client of mine. The photos show both the front and back sides of each with shamrocks on one side and buttons on the other side. 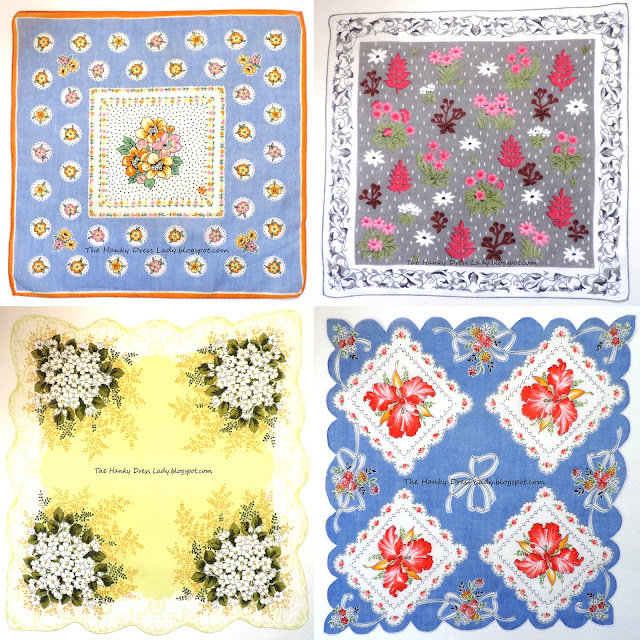 (click to get a closeup view) Both of these were made from just one handkerchief. 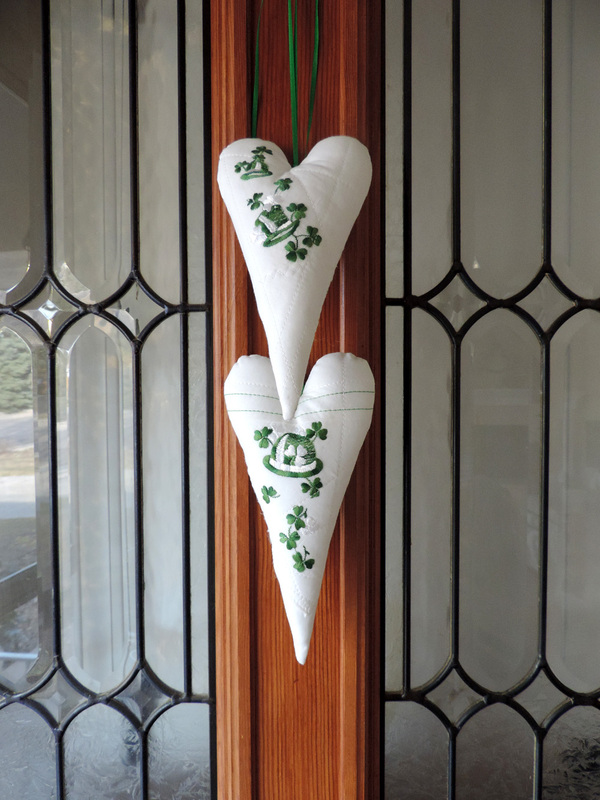 You can use Hanky Hearts as door decorations, on a cabinet nob or almost anywhere you like. I slipped one through the hanging loop of the other here to create a chain effect. 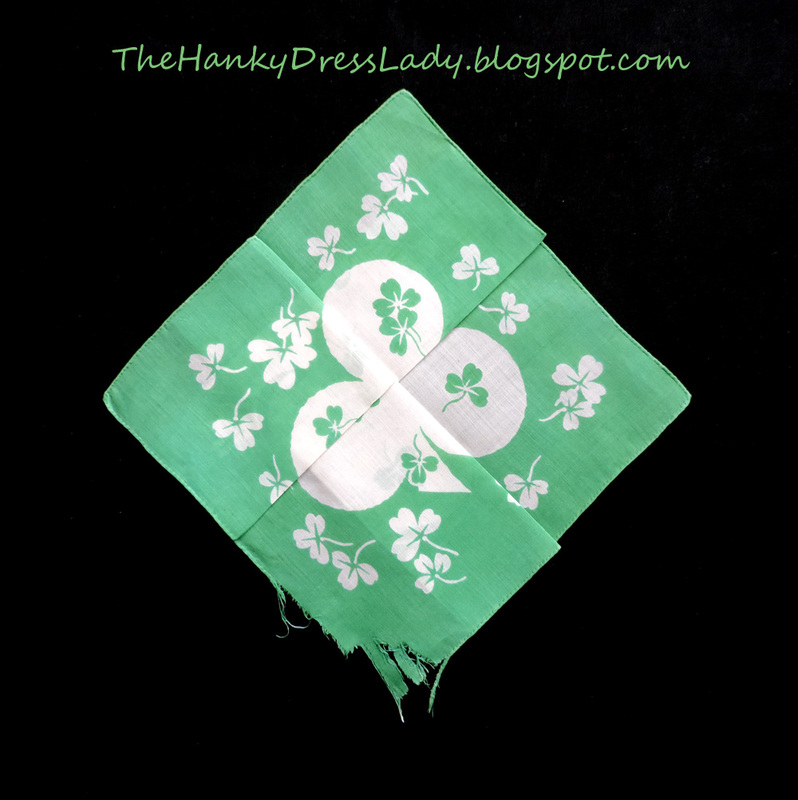 This St. Patrick's Day hanky belongs to the same client...and what a lucky Irish lady she is! At first glance one might think it just a rather odd and old damaged hanky. Not so - this is a rare St. Patrick's Day Puzzle Handkerchief. 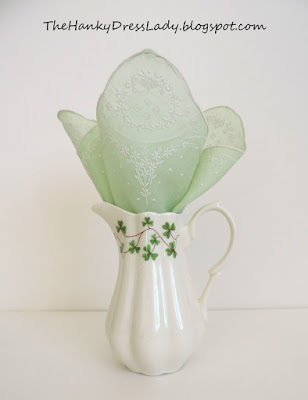 I have a collection of Valentine Puzzle Hankies, but this is the first St. Patrick's Day Puzzle Hanky I have ever seen. When folded properly the lovely Irish shamrock design is revealed. It may be damaged but I think it is still a treasure. I don't have an ounce of Irish blood in me - but I do love the color green! 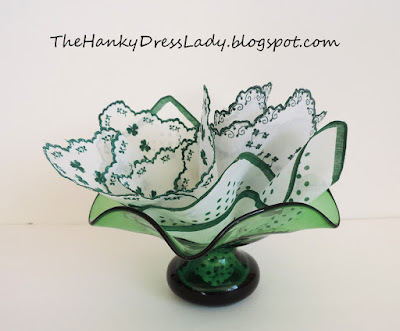 You can create a hanky bouquet with all sorts of containers. Look around and see what you might have to work with and give it a go. 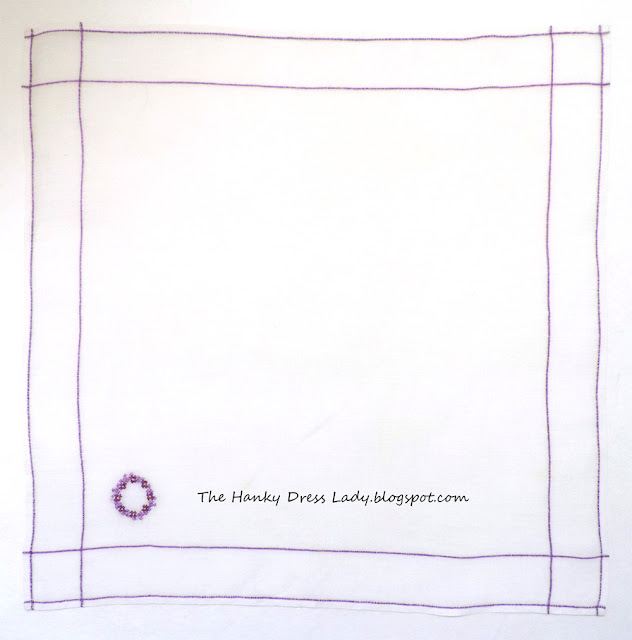 You'll want to starch and iron those hankies to give them a little stiffness so the points will stand up and not flop over. Check out the close-ups below and let me know which is your favorite. February's birth month flowers are violets, primrose and iris. 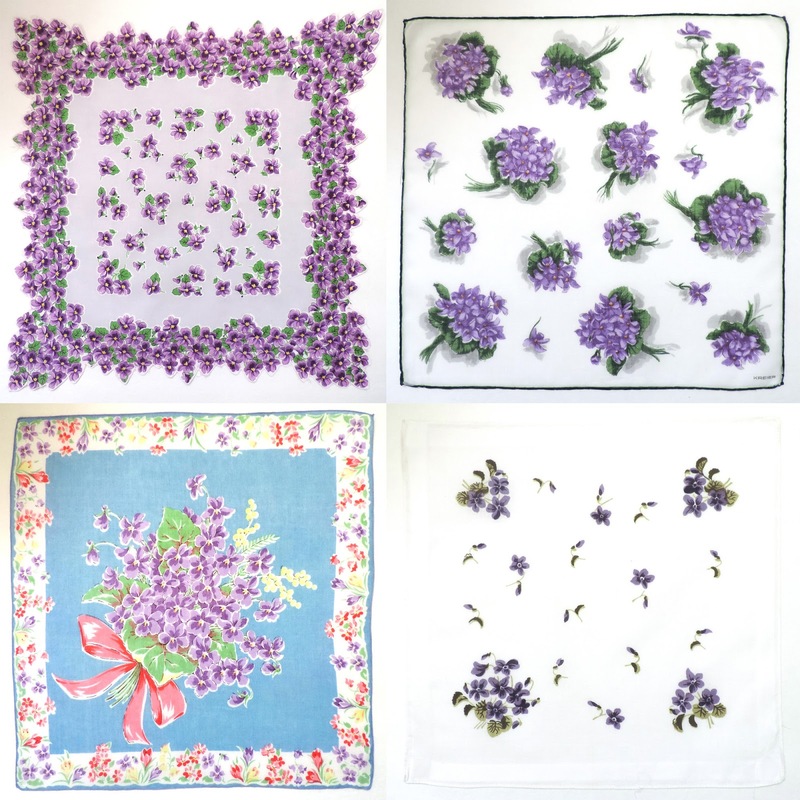 Of the three, violets were the easiest for me to find on my hankies. Above are four lovely examples of hankies with violets from my personal collection. 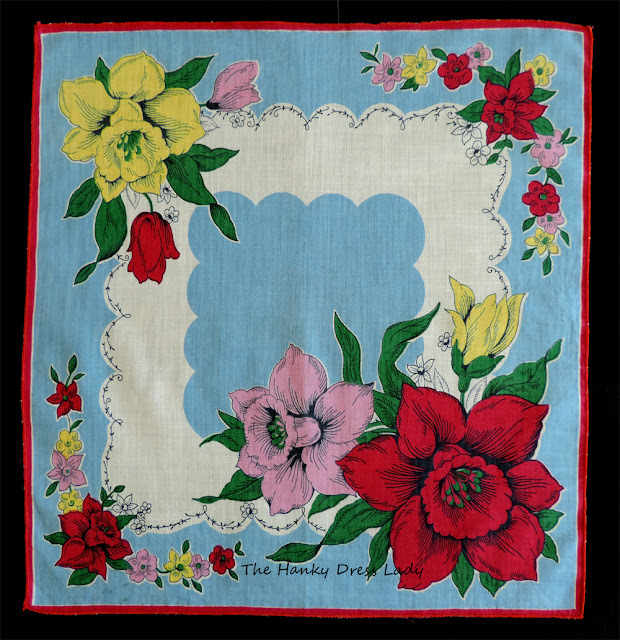 This is a sweet little handmade hanky. I know that because a sweet little old lady told me so and she also explained to me how it was done and that she could remember making some as a child. She told me that the trick is to pull a thread loose and attach a piece of embroidery floss or other thread and pull it through the fabric. 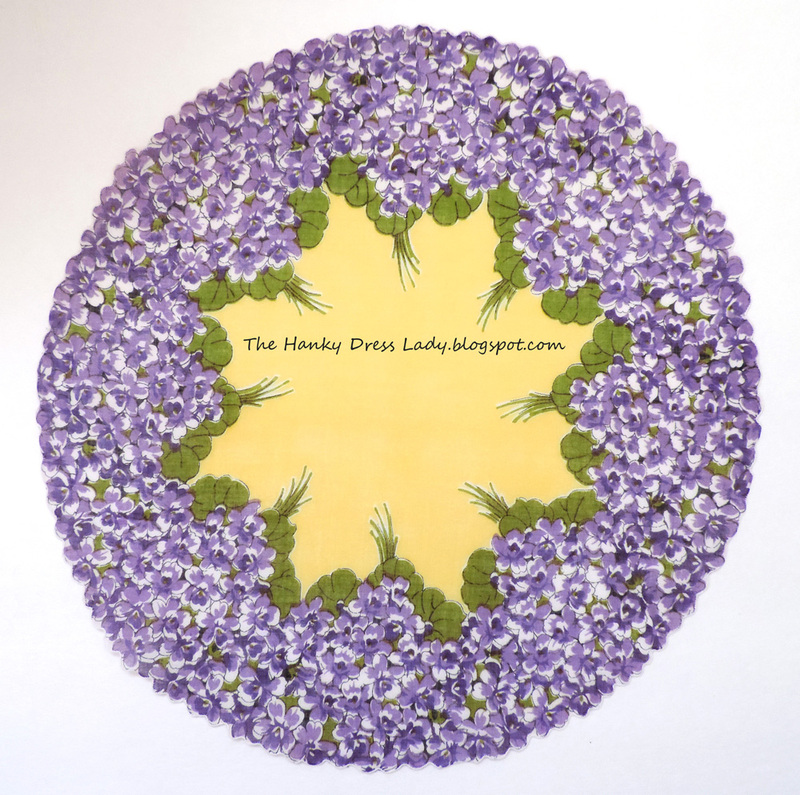 The little circle of violets is hand embroidered on this one. 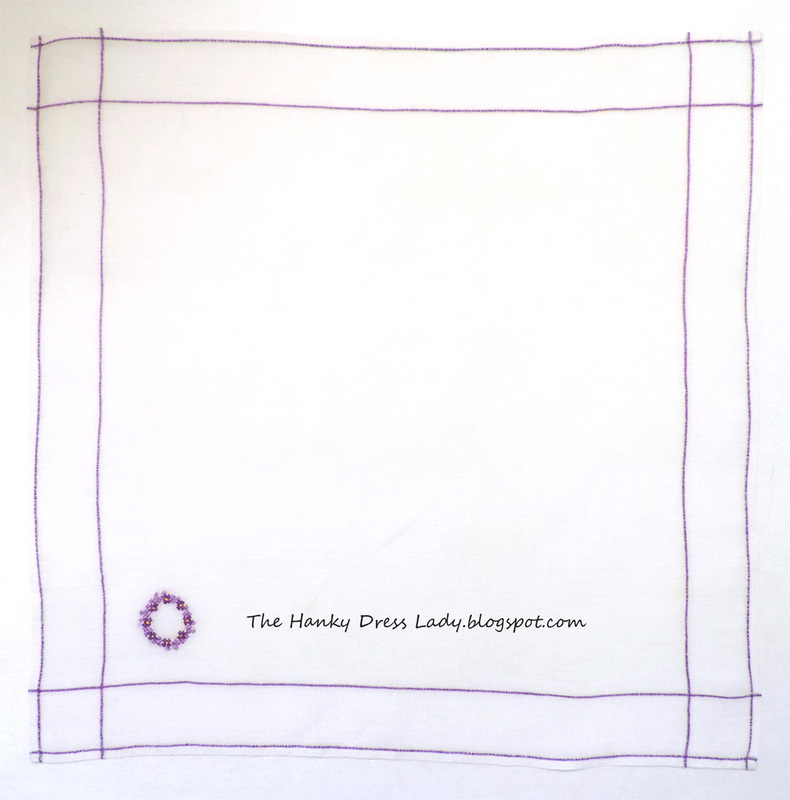 And, finally the hanky is hemmed. 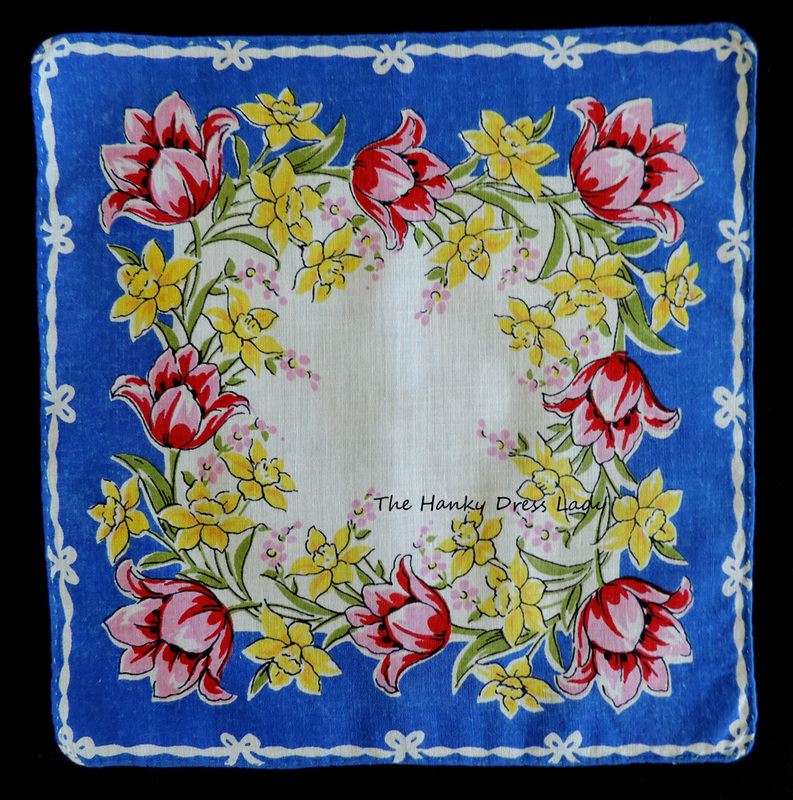 Here we have three primrose hankies and what may be an iris one. I haven't totally convinced myself that this is an iris. It may be an orchid. What do you think? If it is an orchid, then I don't have any hankies with irises on them. 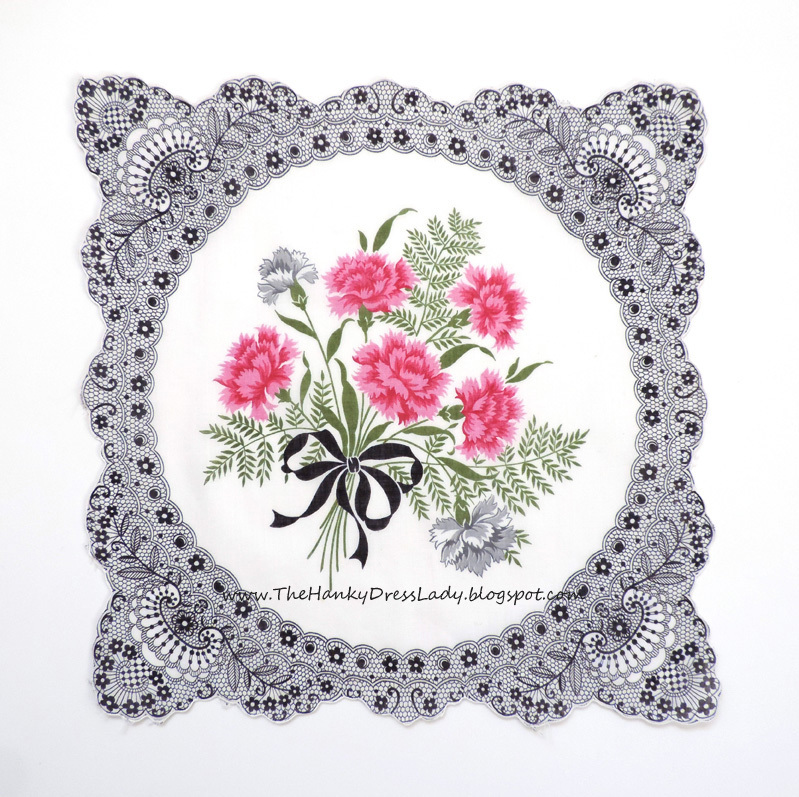 I just happened to have one sweet round hanky simply brimming with violets. 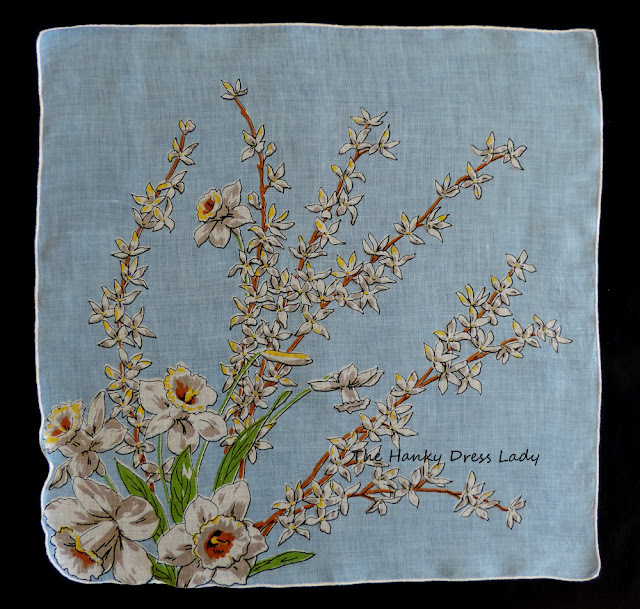 Vintage hanky with pretty little snowdrops in the falling snow. The other January birth month flower - Snowdrops. 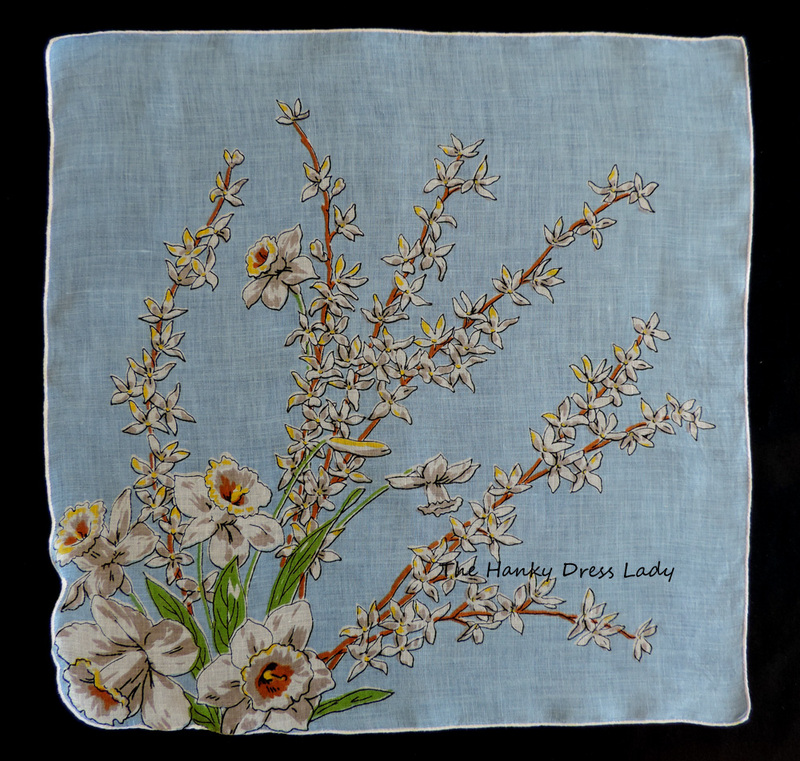 I was doing some hanky washing and it popped up just like pretty little snowdrops do. 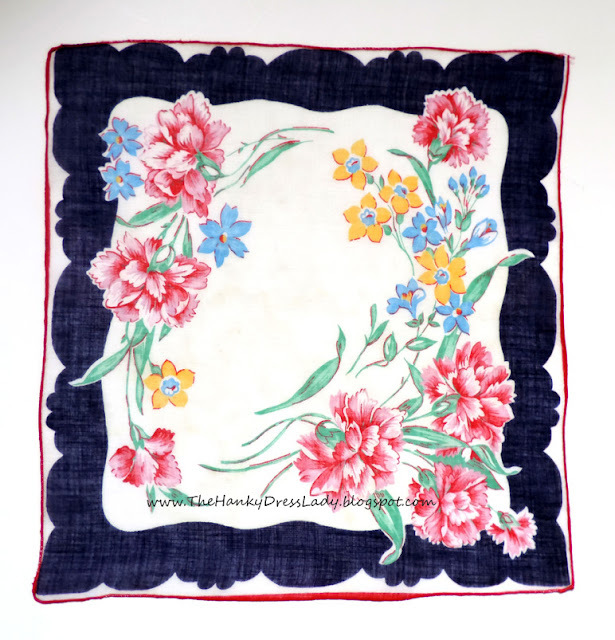 Granted these are pink and red and blue...but, hanky designers did take a lot of liberties. The thing that cinches it are the tiny white polka dots all throughout the outer white border. 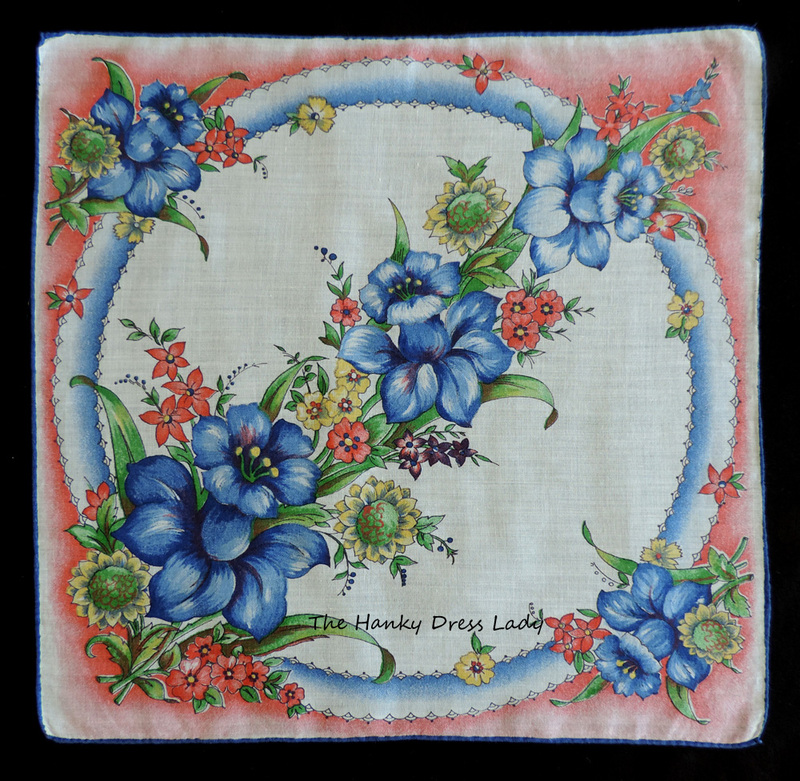 I know you can't see them in the photo (so sorry), but they are there and they they make this little hanky soooo pretty! And...top top it all off...it is snowing today. Most of us know what our birth stone is; but do you know what your birth month flower is; or that you even have a birth month flower? There are various lists of birth month flowers and all the lists do not agree. So what you find here is a compilation of the lists I found. I am sure you have all figured out where I am going with this. There are lots of floral hankies and I want to share some of them with you and tell you a little about your flowers each month. January’s birth month flowers are the carnation and the snowdrop. 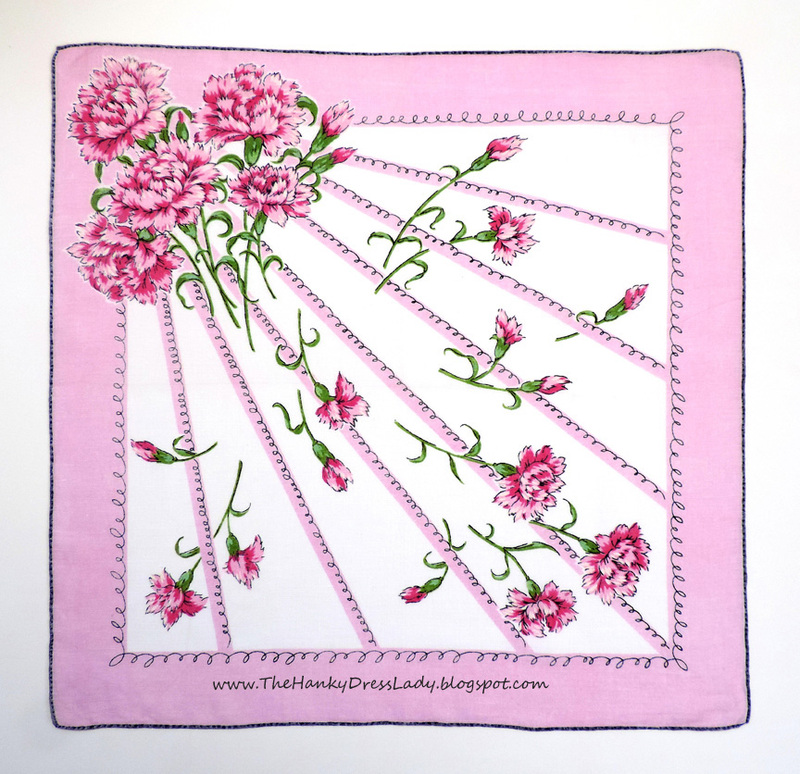 The carnation is said to symbolize love, fascination and distinction. 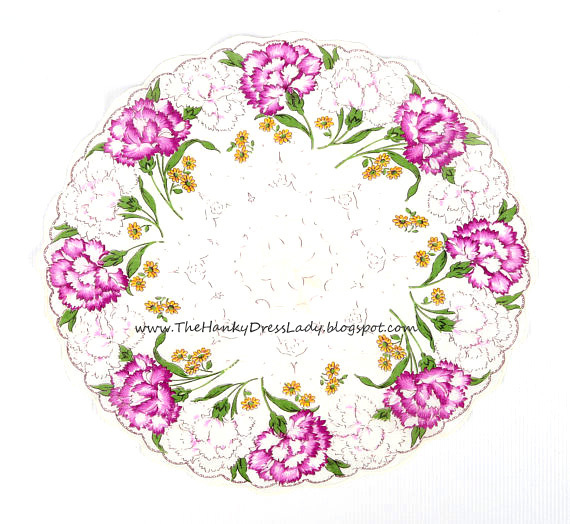 Carnations come in several different colors and each color has a different meaning in the language of flowers. A pink carnation means affection, while a red carnation means ‘I love you.’ White carnations mean pure love, striped carnations mean regret that a love is not shared, and yellow means rejection or disappointment. I haven't found any hankies with snowdrops on them. If you have one I would love to hear from you and share a photo here. Vintage hanky with white carnations which symbolize pure love. 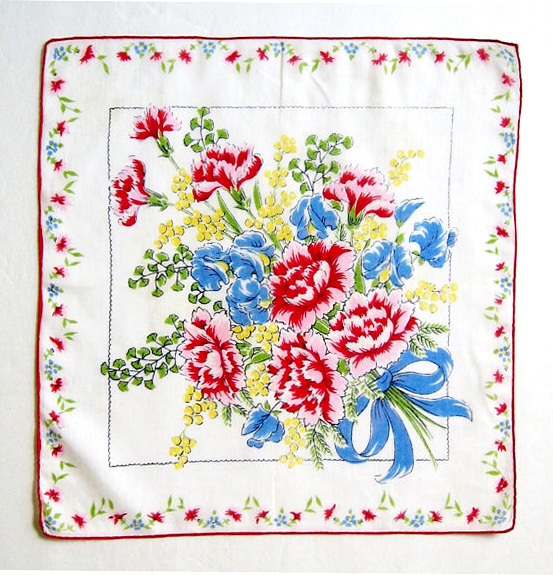 Vintage hanky with lovely carnations, the birth month flower for January. Pink carnations symbolize affection while red carnations symbolize love. 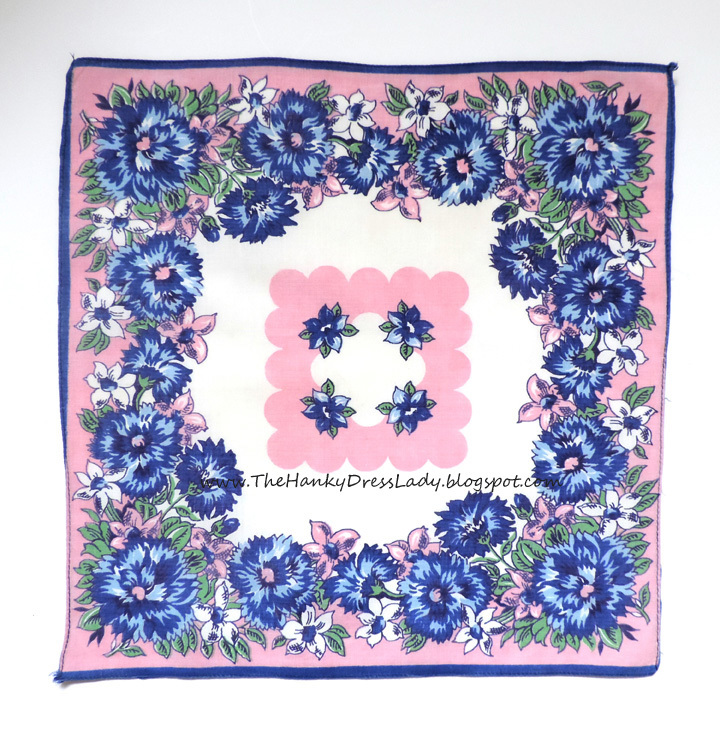 Vintage hanky with lavendar and white carnations. White carnations symbolize pure love. Vintage hanky with pink and red carnations - a January birth month flower. Pink carnations symbolize affection while red one symbolize love. Not sure what blue carnations mean. 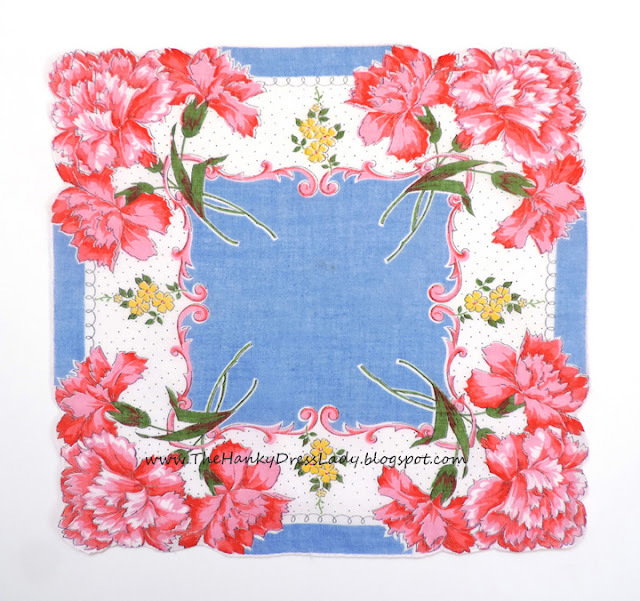 Pink carnations for affection decorate this vintage hanky. 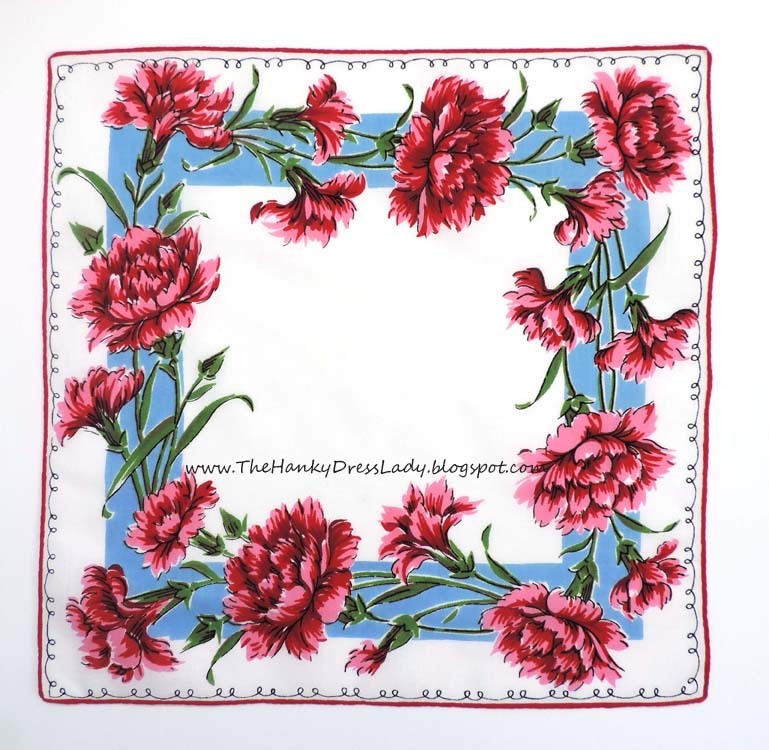 What a beautiful vintage hanky with a January birth monh flower - pink and red carnations. This may be a vintage mourning hanky. Pink carnations for affection, red is for love, and white is for pure love. Sadly, yellow carnations represent disappointment or rejection in the language of flowers. These Hanky Dresses; all with aprons, are a specialty style that was born out of necessity. You know the old adage, "Necessity is the mother of invention." Well that was exactly the case with each one of the dresses pictured below. 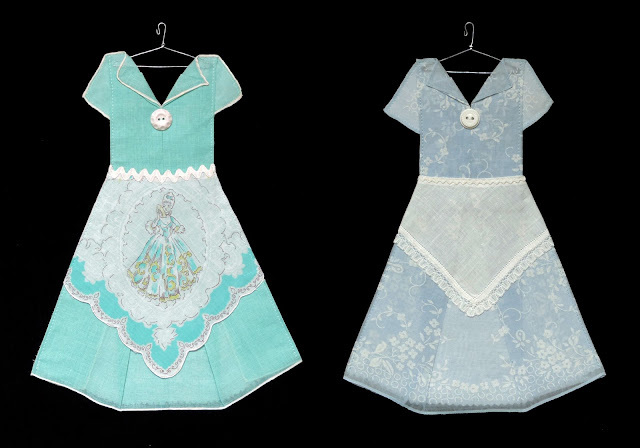 The aqua dress on the right was the first dress I ever made that I put an apron on. I had this charming Southern lady hanky; but there was a problem. Most of the hanky was badly damaged with rips and holes. This one corner was in great shape and I was mulling over what I could do with it when that magic light bulb came on. "Use it to make an apron!" 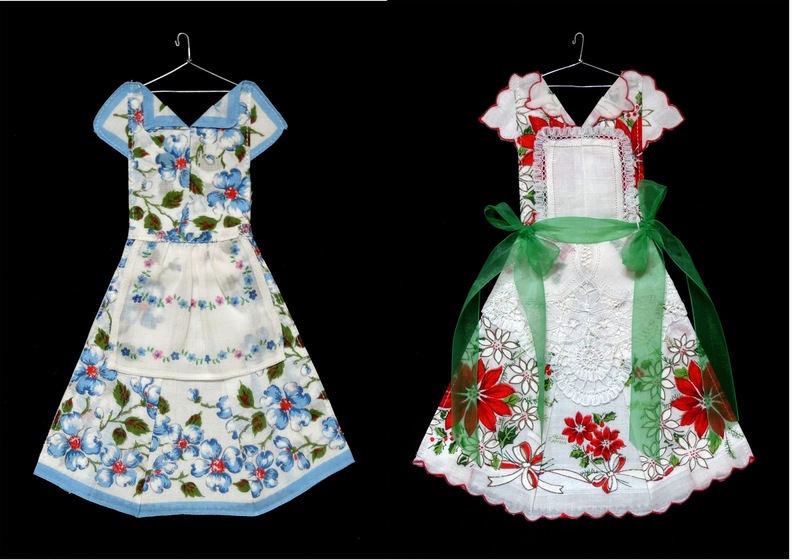 Both of these aprons are made from damaged hankies, as well. The apron on the Christmas dress serves a dual purpose. 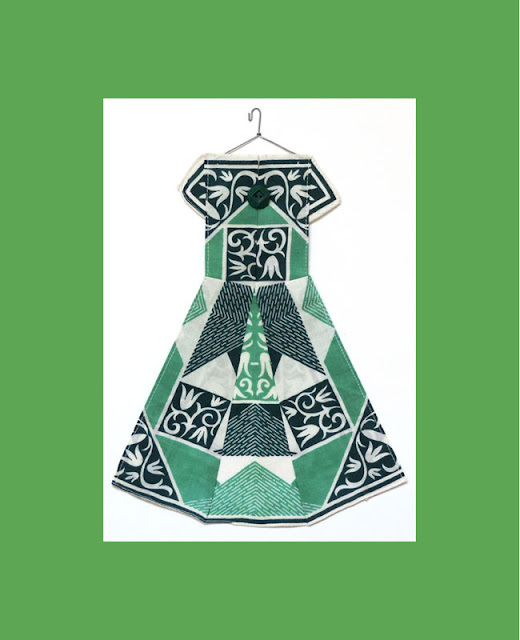 The bib of the apron conceals a less than desirable bodice design on the dress. Both of the above dresses were created at the request of my clients from undamaged hankies. The lavender one is very special because it was created from her grandmother's hankies. 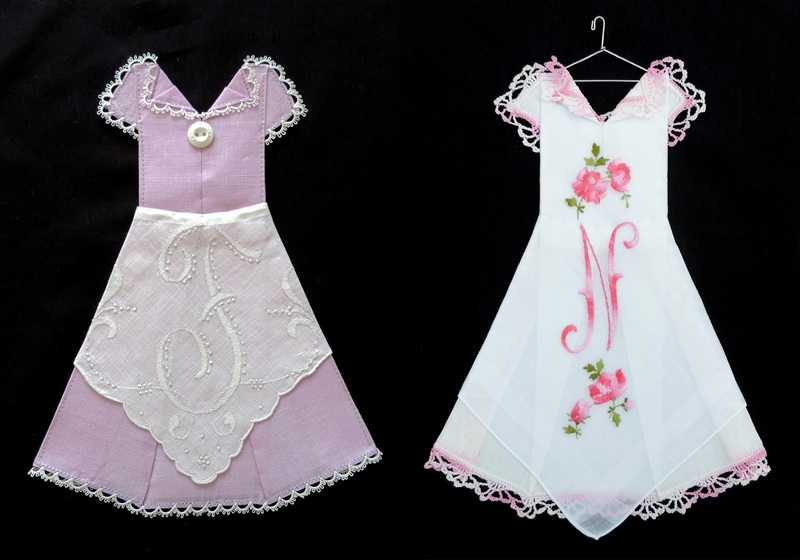 The pink dress was created using two of another client's childhood hankies. You can find the complete story on that one here - N is for Nancy. 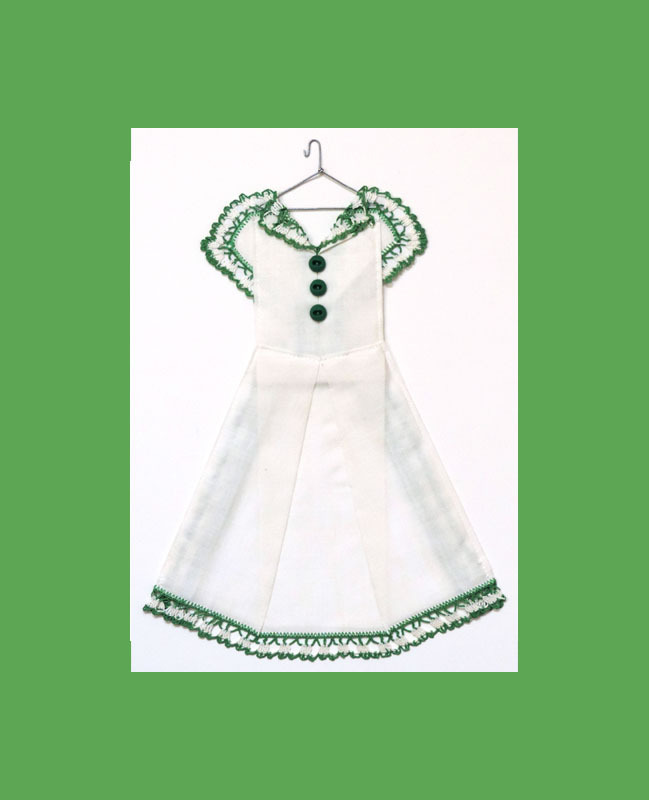 This St. Patrick's Day Dress is another of my early apron creations. 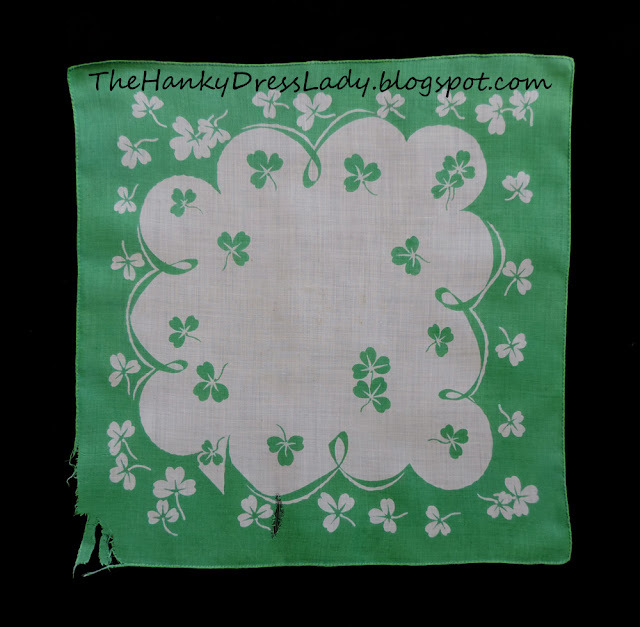 I had this wonderful but badly damaged Irish linen hanky. Zoom in so you can see the sweet little shamrocks in the lace. Is that special or what? 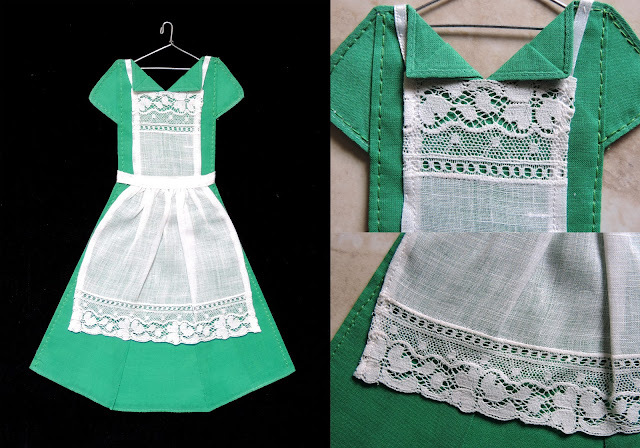 These aprons can be very tedious to make because the seams are so small and they must be made to fit the dress exactly. Looking for last minute Easter decorations? Well I am. 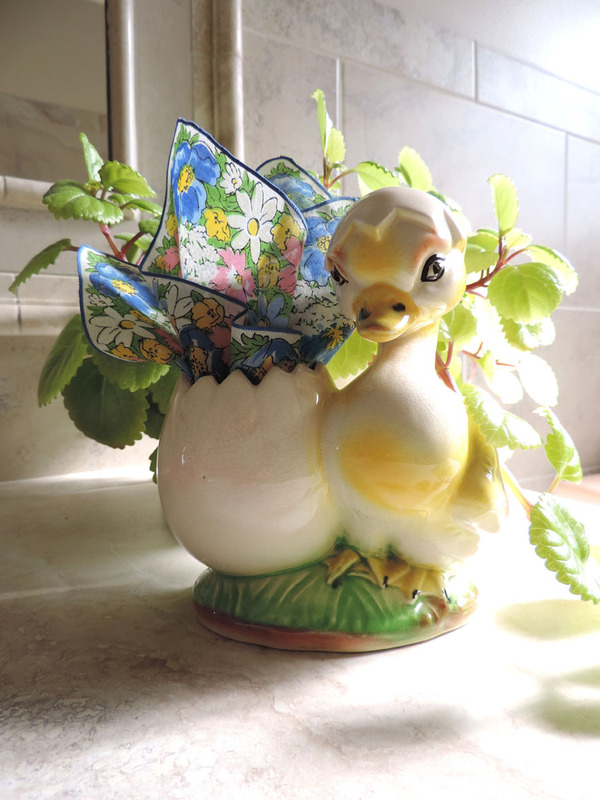 Here is how I am going to spruce up my bathroom a little for my Easter guests. 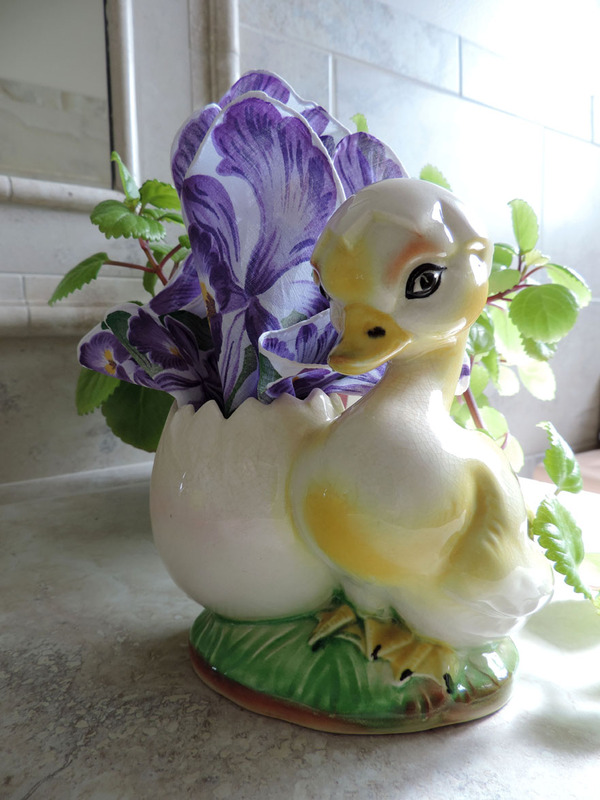 I have this sweet vintage duck vase which just happens to be the exact same age I am. I know this because I found it many years ago at a yard sale and the man that sold it to me said it was given to his mother as a gift by a friend when he was born....and he told me when that was....however, I am not going to tell you, hee! hee! hee!, that's my secret. 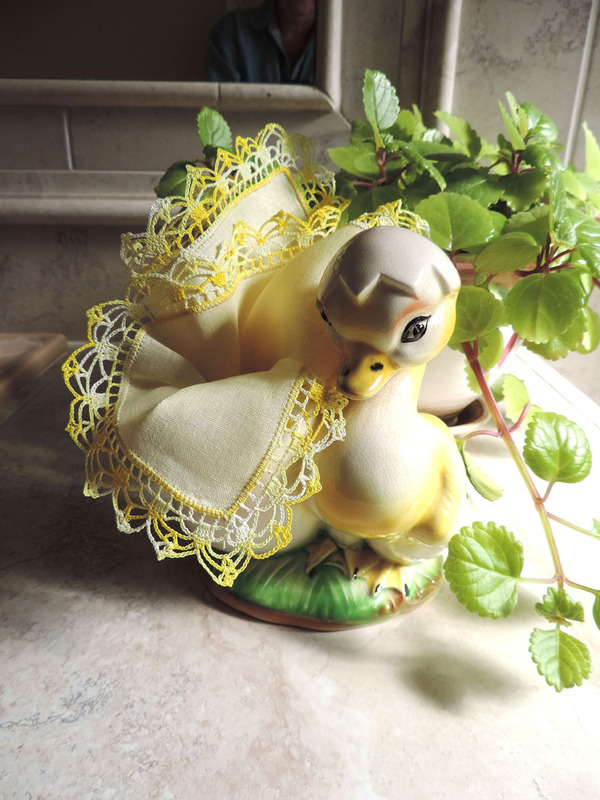 So which hanky do you think I should use in my little duck for Easter? Duck #1 has a lovely purple and yellow hanky. Duck #2 has a vivid spring flowers hanky. 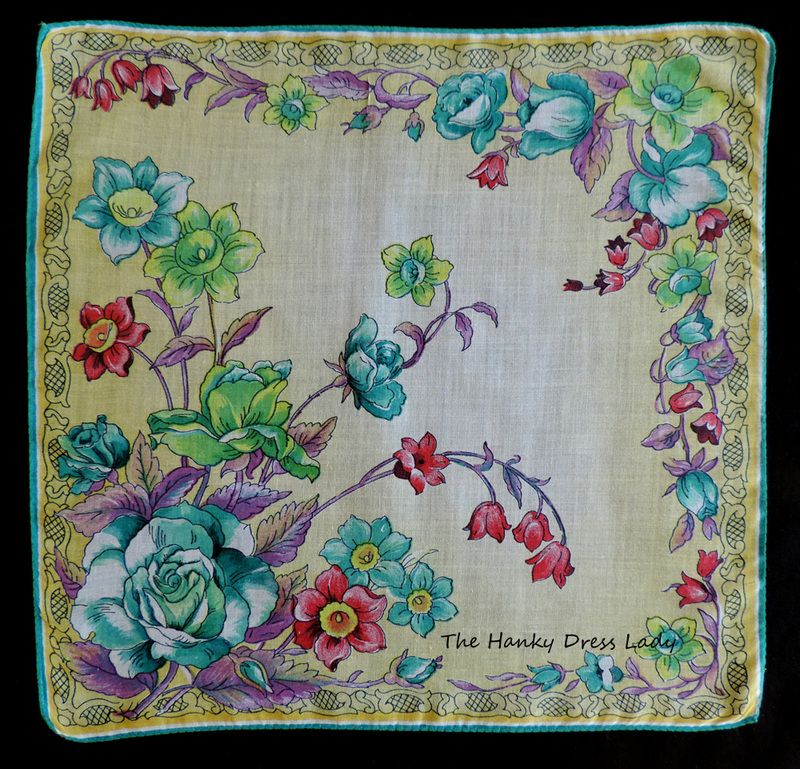 Duck #3 has a hanky with more pastel colored spring flowers. Duck #4 is all yellow and so adorable! 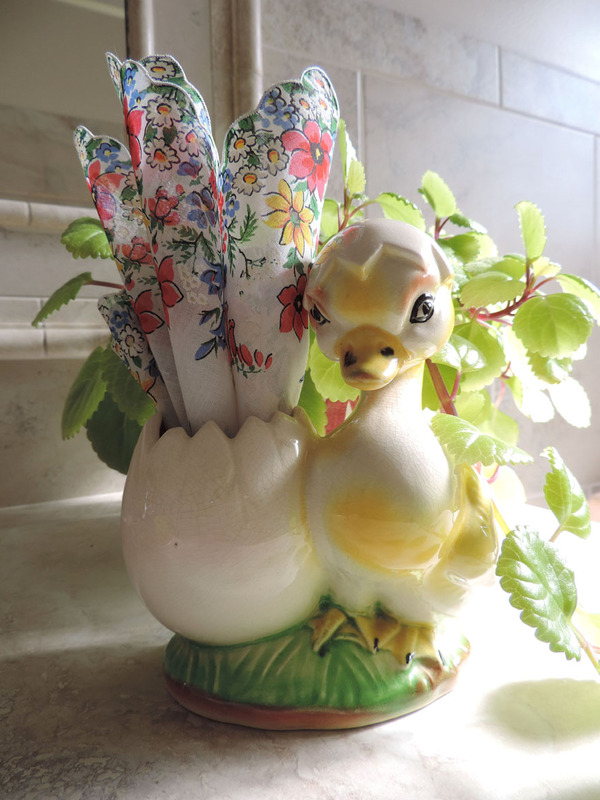 The duck hanky bouquet is actually setting in front of a house plant in my bathroom...he just looked pretty there. So which one do you like best? Please leave a comment below and let me know. Wishing you all a blessed Easter with your family and friends. Which is Your Favorite St. Patrick's Day Hanky Dress? 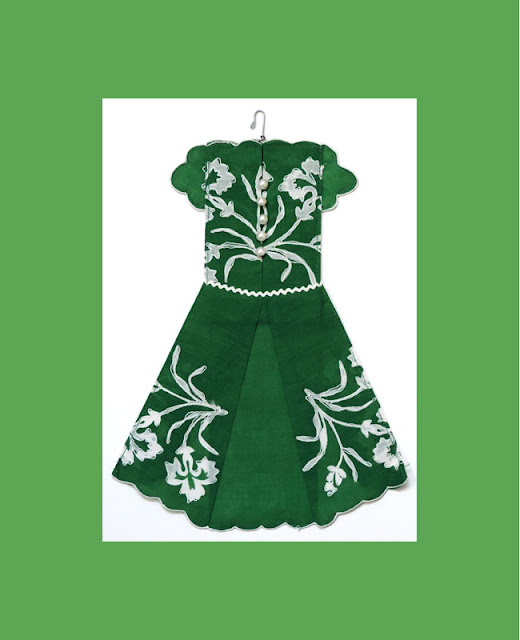 I've put together a collection of some of my green Hanky Dresses for St. Patrick's Day. I have described each one's special features here. Remember to click on the photo so you can get a closer look at the details described. Once you're done looking; please hop on over to my Facebook Page and vote for your favorite. 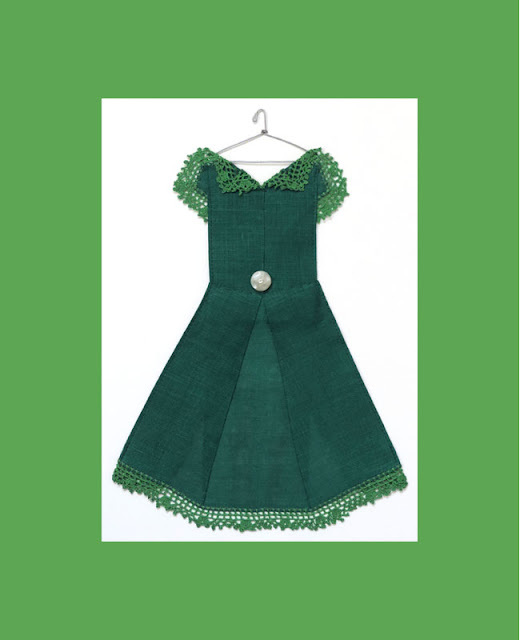 This first Hanky Dress was made from a lovely green linen hanky with a hand crocheted edging. The button at the waist is actually a four-leaf clover with a rhinestone center. This second dress is the perfect contrasting companion to the first dress. 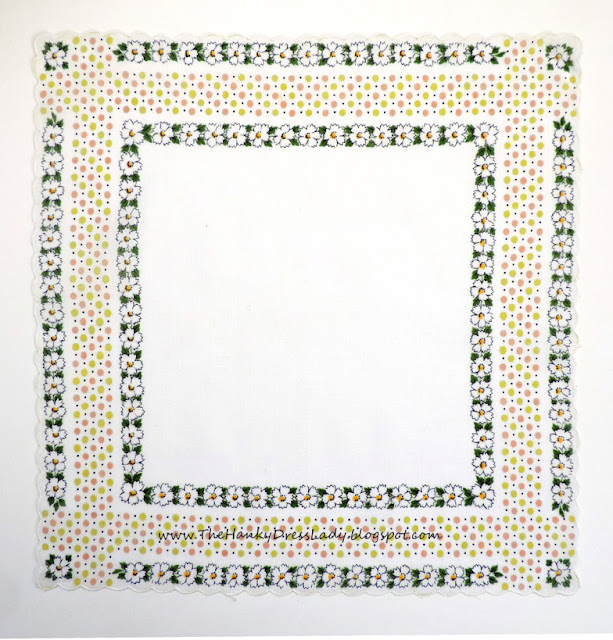 It is made from a white linen hanky with a lovely green and white crocheted edge. 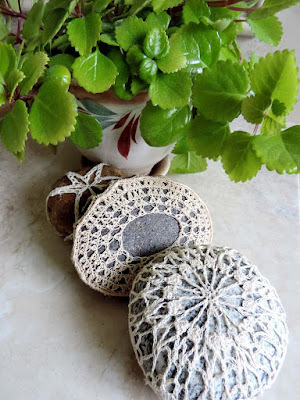 The sweet little green buttons are a classic vintage style. This vintage hanky was a rare find and I just love the Celtic look this Hanky Dress has. I think it could also be interpreted as Art Deco. 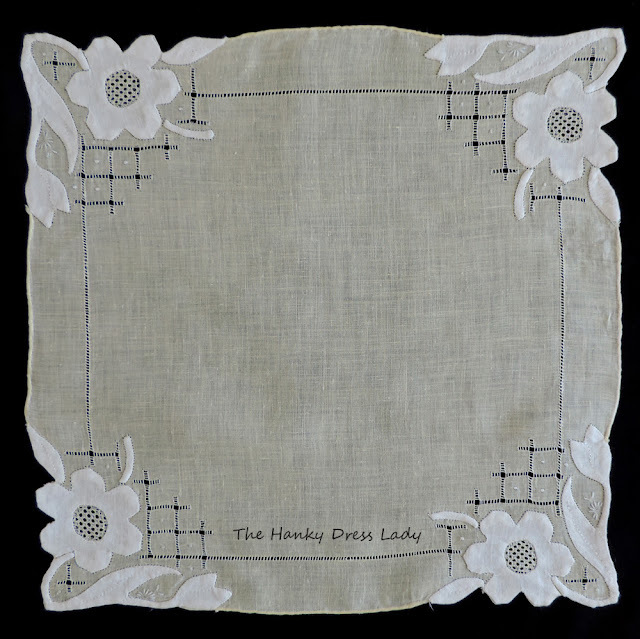 This Hanky Dress is simple yet very special. 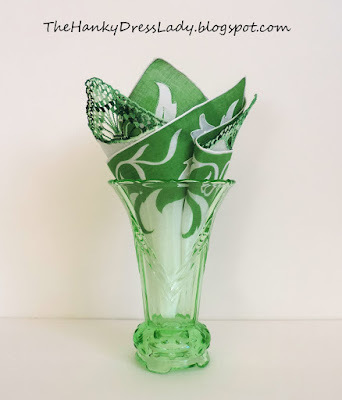 The design is created with white French knots worked on a green linen hanky. 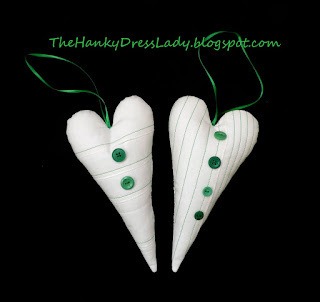 The button is a lovely carved mother of pearl. 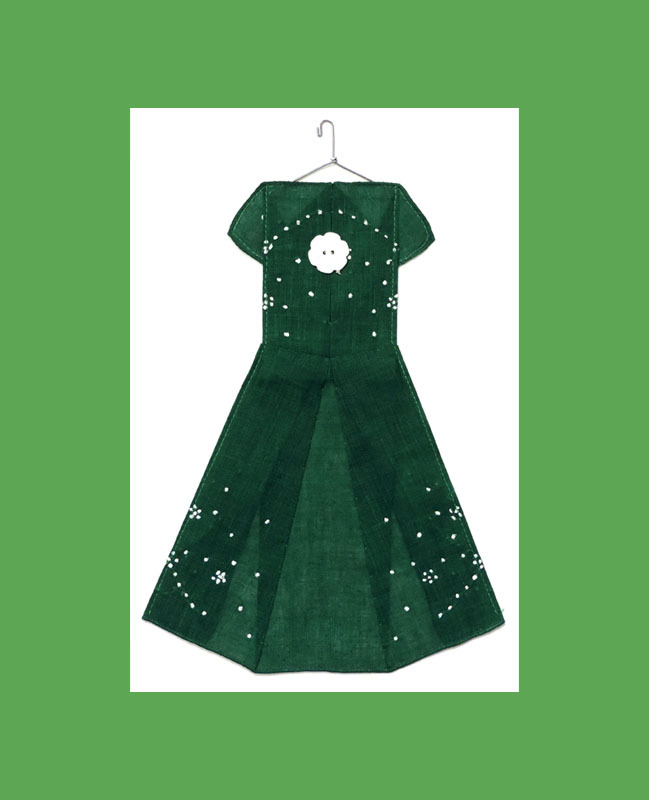 This Hanky Dress is a bright kelly green cotton with a white floral design which is machine overstitched. The buttons are small vintage imitation pearl; and, I added some tiny vintage rick rack at the waist. 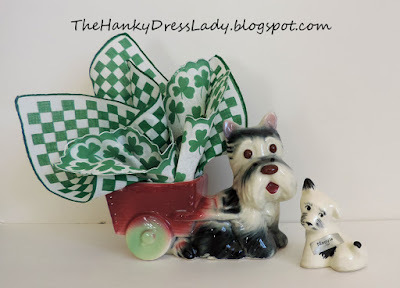 One of my oldest and personal favorites is this sweet little Hanky Dress. It is smaller than the others at only nine inches. 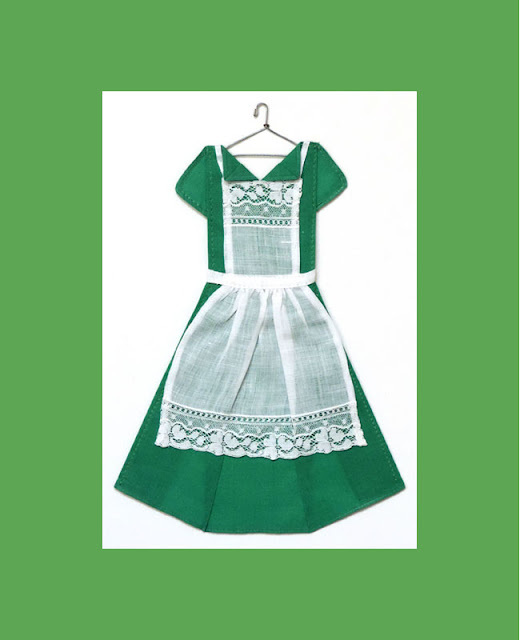 The apron was created from a damaged Irish linen hanky. What makes it so special are the four-leaf clovers incorporated into the design of the lace. Today I want to share with you the work of a very talented artist and relatively new friend of mine who just happens to live in my neighborhood. We met a couple of year's ago when I was watering the flowers around my steel magnolias and she came walking by early one morning with her sweet dog, Sage. 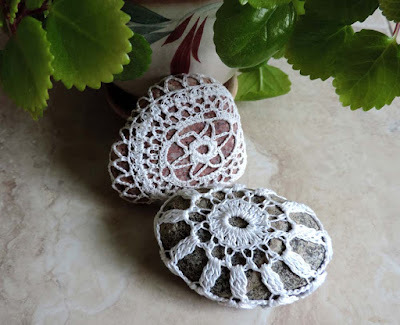 Marti is a multi faceted crafter and artist who excels in many areas. She sews, quilts, crochets, knits, is a woodworker, paints....and wants to try everything else. Have you all seen crocheted stones? Well, I have been admiring them for quite some time. Sadly, I am not skilled at crocheting....but Marti is!!! 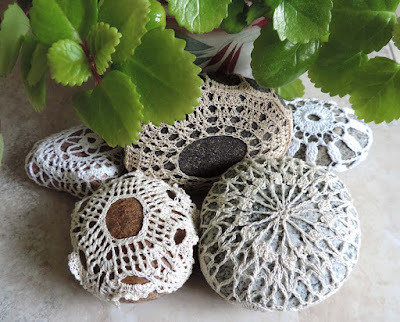 So I asked if she had ever seen crocheted stones and suggested she give it a try. Here is the result. Aren't they just wonderful! They make great desktop paper weights, look pretty on a dressing table, or can be used as a coffee table conversation piece. 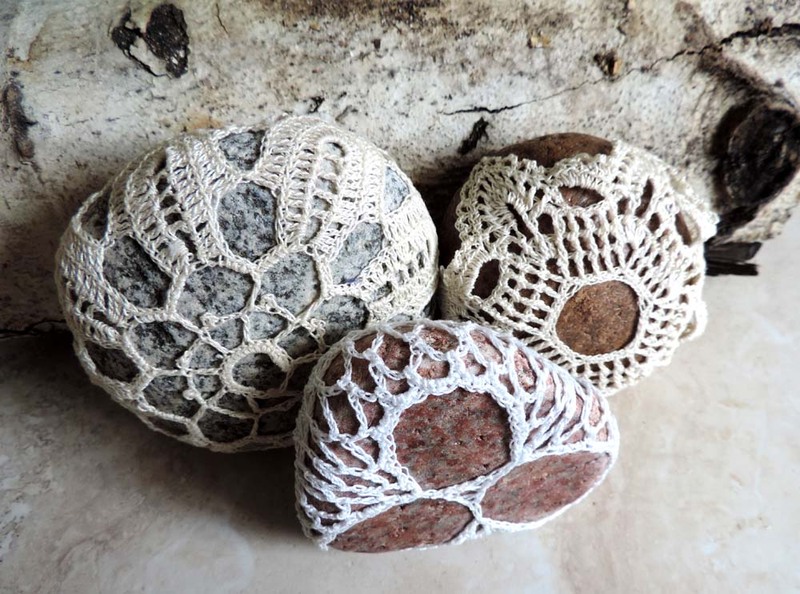 She creates a free form of crochet designed to cover the entire stone; therefore, it is decorated on all sides. I have tried to get photos from several angles for you. By the way - this conversation all got started because we found out that we were also both long-time rock hounds. 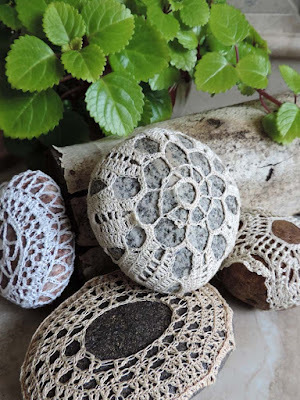 We love rocks! Wait until you see Marti's paintings! She paints these marvelous scenes and word signs on weathered wood. I hope to share some of those with you sometime soon. She is also new to Etsy and and you can find her there as the Resourceful Crafter.